Great Beach House At Great Location! The Rushings invite you to enjoy an exciting Florida vacation in our Beach House on Anastasia Island, in quiet Surf Crest Village. The house is adjacent to the pool and in the center of the oceanfront complex of individual one and two-story homes. There is a picturesque covered gazebo atop the dunes for your enjoyment, with private access to an uncrowded white sandy beach. WARNING: If you come once you'll be hooked!!!! Universal Studios, Kennedy Space Center and many other wonderful attractions. World Golf Village and Outlet Shopping Malls are just minutes away. This is a Smoke-Free and Pet-Free Beach House!!! House, 2 Bedroom- 1 Bath- Sleeps 4-6. Phone, Air Conditioning, Cable, Wi-Fi TV, DVD/VCR, Pool, Microwave, Dishwasher, Full Kitchen, Washer/Dryer, No Pets Allowed, Linens provided, Cookware ad utensils provided, BBQ Grill, Club House. A lovely little beach cottage, very clean and well equipped with everything needed.....except a beach towel. We enjoyed our stay although the weather was poor and quite chilly. The beach is lovely and super busy at the weekend and we found some lovely places to eat quite close by. First of all this is probably the cleanest vacation home I have ever rented. The home had everything that I needed from towels to kitchen items. The bed was very comfortable and it is the first time that I slept good on the first night of my arrival in any bed away from my bed at home. It is just a short walk to the beach but it was a little cold for the beach. There are lots of places to eat just a short drive. I will definitely stay here again if possible the next time I am in the area. We really enjoyed our stay. The house was perfect for our family weekend. 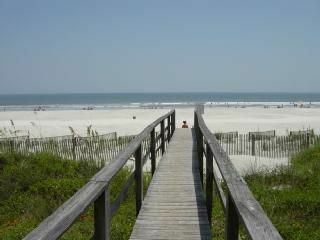 The location on the beach is perfect and it was really close to Historic St. Augustine. The house was really nice, clean and comfortable and equipped with everything you need. I would definitely stay here again. Very cute beach house, close to everything!! This little cottage was perfect for our family of 5. Is very well stocked for anything need to do from cooking, toys, beach stuff, outdoor seating. Short walk to the beach and pool just outside the door. We had no complaints or issues. Cable and wifi was perfect. Beds were comfortable and clean!! We would definitely go back!! Boating, Surfing, Historic St. Augustine, Theme Parks. A deposit of $100 is required to guarantee the reservation. 7 day minimum stay required, 3 night minimum based upon availability. Please email owner prior to booking for less than 7 night stay. $100 housekeeping fee is required for less than 4 night stay.